This is a tale of how my grandfather’s pipettes found their way into a pot of odds and ends that sits on my desk. The story involves a legacy he left that had the potential to kill me, much of my family and probably a good few neighbours, but despite that I can’t help feeling respect and nostalgia for my grandfather every time I pull a pencil out of the mug that it shares with his old lab tools. And sometimes when I’m suffering from writer’s block, I’ll reach for them, play with them a bit, think of him and more often than not I’ll find some inspiration in them and his memory. My grandfather was one my greatest scientific influences. He was Danish, so of course we called him MorFar (mother’s father in Danish). And because he lived in Copenhagen, I didn’t see him often, maybe once a year. So my memories of him are really a series of vignettes centred around our family holidays to Denmark or his visits to us. Morfar was a chemists and horticulturist who believed in organic food production decades before it became a mainstream movement. And he shared his love for plants, science and all things natural with me. When I was a kid he’d take me for walks through the rolling wooded countryside of English Home Counties or the flat expanses of the Baltic coastline and we’d graze on the edible plants that he’s extract for the headrows along the way. Sometimes we’d come across a waterway and we’d crawl to the edge and gaze at the pond skaters, water boatman and daphnia dancing below the surface. And maybe we’d catch a few in in our empty lunch boxes and examine then using the microscope that he’d whip from his pocket. Then there was his allotment, well a small holding really. Well after he retired he carried on his research there, creating fascinating hybrid plants (his pear shaped yellow tomatoes were to die for). And I remember Morfar constructing a greenhouse there. Being a great believer of recycling he built it entirely from waste materials (he bought not so much as a single nail). But it was his laboratory, situated in an old redbrick outbuilding (where he analysed chemical compositions of soils) that really grabbed my attention. To my 10 year old self this was a fascinating Alladin’s caves of strange instruments, bottles and herbological mysteries (although this was well before Harry Potter). But not everything in Morfar’s lab had a strict research focused purpose. He enjoyed the theatre of science as well. If we were really good, he’d get out his sodium metal, mysteriously sitting in its jar of oil (he’d acquired it some time in the distant past when health and safety wasn’t quite what we know and love now. It had no practical reason for it beyond finding it amusing). Then he’d gingerly take it to a quiet corner of his plot and, with a long pair of forceps, he’d carefully extract a lump of the soft glistening metal before hurling it into a bucket of water. FIZZZZZ, BANG! Maybe you’ve seen that done in school, or on a YouTube video. Trust me Morfar did it better. And it was these sorts of experiences that inspired me and started me down my scientific career. Because he showed me all the wonders that science has to offer and as importantly the joy gained from sharing that wonder with others. Jump forward a few years and now I have my PhD in biochemistry and am working as a researcher at Goethe University in Frankfurt. I saw him less and less frequently so I was particularly excited at the prospect of seeing Morfar at a rare Anglo/Dansk family gathering. As I walked up my parent garden path I saw him sprawled out on the grass next to the pond. I rushed over thinking he’d collapsed. But of course something in the pond had caught his attention so there he was flat on his stomach, head over the edge of the bank of the pond gazing at the life whizzing around just inches from his nose. I joined him on the damp grass, just as I’d done many years before. By now Morfar’s health was failing and his advancing years meant he could no longer keep on top of his small-holding, but his fascination for the natural world was undeterred. He maintained a passion for discovery, so something as mundane as lack of lab space wasn’t going to put him off his research. His solution was simply to move the contents of his small holding’s lab, lock-stock-and-barrel, to his apartment. That weekend when we lay together on the bank of the pond was the last time I saw him. So the first I really knew of the extent of his one man research station was on the weekend of his funeral. I’d joined the rest of my family to clear out his four room apartment situated in a high rise block of flats on the edge of Copenhagen. As I stepped in my jaw hit the floor, the place was like some strange hybrid between a domestic abode and a scene from a 60’s B-movie about a mad scientist. Sharing the kitchen surfaces with all the usual appliances were pH meters, hot plates, pipettes, strangely labelled bottle and bags upon bags of soil samples. The balcony was a jungle like green house and the living room was crammed with bookshelves containing bottles, jars and canisters of chemicals of every description. This was clearly going to be no ordinary house clearing. Not that the rest of my family saw it that way, they were already busy opening bottles and upending them into the kitchen sink. I pointed out that this probably wasn’t a good idea. The causally reply, whilst the contents of another vessel disappeared down the plug hole, was that they were sure my grandfather would have labelled anything dangerous with appropriate warnings. A cursory glance around the kitchen quickly dispelled this optimistic notion and I put a firm stop to the favoured disposal method. In this last group there were a 5 litre jar containing a clear oil and about 1kg of white crusty cubes. As I opened the lid the thick smell of the petroleum oil triggered a decades old memory. This was that very same jar or sodium metal that we’d ‘played’ with as kids. Over the years the sodium had gained a dense oxide crust encasing the soft metal within. But the sodium wasn’t the worst of it, oh no. The winner of the prize for the worst thing to leave to your grandchildren to clear up after you’re gone went to the solutions of potassium cyanide (apparently in years gone by he had used it to fumigate greenhouses; simply place a little in a dish, pour on the acid and run. Then come back a few hours later (after having carefully aired the place) and hey presto there’s not a bug or beasty in sight). 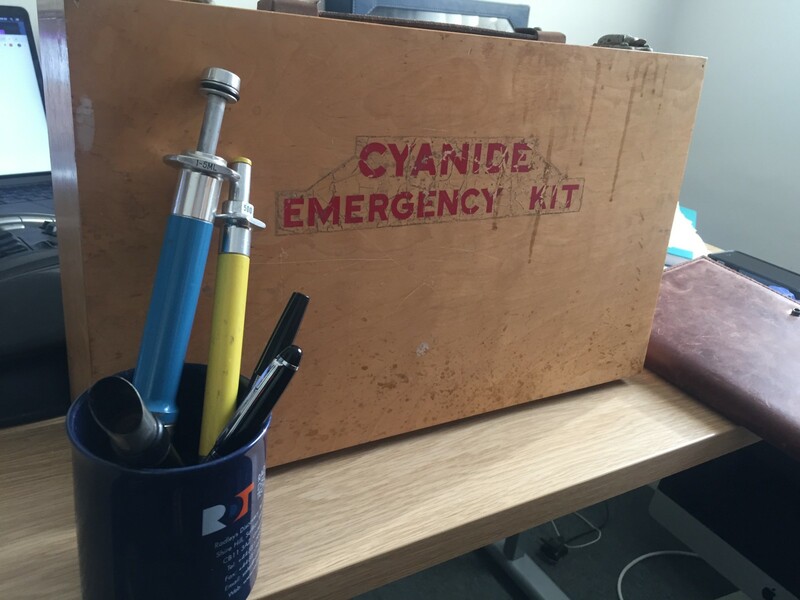 Now imagine what would have happened if the potassium cyanide had ended up in the drain with some of the acids… mixing in the U-bend , liberating cyanide gas and bubbling up through the apartment block’s drains really didn’t bear thinking about. So here’s the situation, I’m faced with chemicals enough to equip a decent laboratory and some of them so hazardous that, if I were to use them in my University lab I would need to complete pages of risk assessments and have emergency antidote kits on hand. How then to dispose of them? Someone suggested slipping some into Morfar’s casket. Or throwing the sodium into the sea. But instead the rest of the week was spent gingerly driving the agglomeration of bottles and jars to a rather surprised but very helpful Copenhagen University chemistry department for disposal. A little later, once the chemicals had been cleared out, the clothes had been boxed up for the charity shop and the furniture distributed around the family, there sitting on an otherwise empty kitchen work surface, was a pocket microscope and a pair of pipettes. I slipped them into my pocket.